It Is Fixed Appliance Repair is the best choice for refrigerator, washer, dryer, dishwasher, oven, stove, and microwave repair in Atlanta, Georgia. Our service is fast, our techs are friendly, and our prices are always affordable. When you put your trust in It Is Fixed for appliance repair or installation, you know it will be done right the first time, every time you call. There are a lot of options for appliance repair in Atlanta. It is often hard to know where to start. You may not know how to choose an appliance repair service that best meets your needs. Even though you have many choices, we want you to feel confident when you trust It Is Fixed with your home appliance repair needs. We stand behind three basic principles that we feel sets us apart from the crowd. We want more than to just be good at what we do. Every member of the It Is Fixed Appliance Repair team is passionate about providing excellent customer service. We have hundreds of five-star reviews from customers such as yourself because we value all of our customers. The chain stores often treat their customers like numbers on an assembly line. That’s not who we are. It Is Fixed cares. Whether you’ve booked us for a minor service or a major repair, you can always expect the same courteous, efficient service for which we’re known. We work to ensure you’re always fully satisfied. The technicians at It Is Fixed Appliance Repair have years of field experience. Each appliance repair specialist is fully licensed, insured, certified. Put simply, our technicians are the best in the business. When we complete a repair, we don’t just close up and walk away. We always make sure you get the service you paid for. That’s why we offer a full 90-day, money-back guarantee on both our parts and labor. Good news! Booking an appliance repair or service should be the easiest part of your day (especially if part of your day involves dealing with a broken appliance). Call (404) 407-0071 or request a service call online. You’ll never have to punch numbers in an automated system; you’ll speak to a real person every time. Right away we’ll set up an appointment that works around YOUR schedule. Need an after-hours or weekend appointment? No problem! We work until 7:00 PM Monday – Sunday. Better yet, we don’t charge extra if you need an appointment for the weekend. We’re happy to have your business every day of the week. When you book with us, you don’t have to worry about taking the day off work just to wait for a technician to arrive. We schedule our appointments, in short, two-hour windows so you can get the service you need and get on with your life. We’ll send you a text or email notification to confirm your appointment, and even let you know when the technician is on the way, so you’re never caught off-guard. When the technician arrives, he’ll thoroughly inspect your appliance and provide you with a professional recommendation along with an upfront, no-surprises estimate for service. We offer commitment-free estimates because it is important to us to ensure you get the fix that best meets your needs. Sometimes we may recommend buying a new appliance. If the cost of repairs will exceed more than half the price of a new machine, or your appliance is more than 15 years old, it is often a better investment to replace the unit. If we could diagnose your problem or give an estimate for installation over the phone, we would! Unfortunately, the only way to provide an accurate assessment is in person. Keeping our prices affordable for every budget is a priority for us. That’s why our service fee is only $39.95, and we never charge extra for weekends or after hours appointments. If you complete a repair or installation with us, the diagnostic service fee is free. Some companies will lure you in with “low” prices and then charge hidden extras. It Is Fixed Appliance Repair is always 100% upfront with our pricing. We don’t charge additional fees for night, weekend or holiday appointments. There are no mileage or travel fees. You only pay for parts and labor, and you’ll always have an estimate before we ever start service. We want to help you save even more money, so if you request a service call using our online form, we’ll take an extra $20 off your total bill. The following list will give you an idea of what other customers have paid for appliance repair in Atlanta, GA. When it comes to refrigerator repair, It Is Fixed Appliance Repair technicians are the experts. Whatever brand or type of refrigerator you have, we can take care of it, whether you have a side-by-side, bottom freezer, top freezer, built-in or French door model. We service all types of models including top freezer, bottom freezer, side-by-side, built-in, and French door refrigerators. If you have a wine cooler or stand-alone ice maker, we can assist with that too. It Is Fixed doesn’t just repair refrigerators! We can help maintain and install your unit as well. 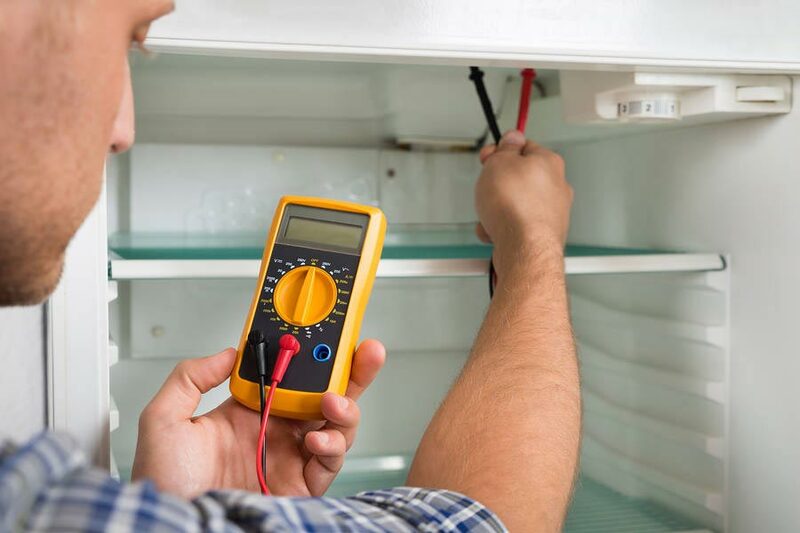 Our technicians have the tools needed to recharge the Freon in older model refrigerators, but we can also perform basic services like cleaning the compressor coils. If you’re getting an error on your Whirlpool refrigerator, check out our Whirlpool Refrigerator Error Code Repair Guide. We don’t just service Whirlpool refrigerators though. We can take care of all major brands including Sub-Zero, Frigidaire, and GE. If your washing machine stops mid-cycle or won’t drain we can solve the problem before Mount Washmore piles up too high. We are familiar with all types of washers: top-loading direct drive and Cabrio, as well as front-loading high efficiency (HE) washers. If you would like to DIY the repair yourself, we can help with that too. We have a lot of helpful washing machine troubleshooting guides, and if you see error codes on your Whirlpool top-loading washer, our comprehensive guide can help you resolve the issue fast. A dryer may not seem like a necessity when you can always hang your clothes up to dry outside. However, if you live in a condo, or your subdivision has an HOA, you may be breaking rules by hanging up your clothes. Unlike other states, there are no laws in Georgia that protect the rights of homeowners to hang up their laundry. If your dryer isn’t getting hot, that can be a real problem. Fortunately, you can rely on It Is Fixed Appliance Repair when you need help. We can even help find solutions to mystery problems, like a dryer that is making a weird noise, or a smelly dryer. We don’t just repair washers and dryers, we install them too. An improperly installed washing machine can cause your clothes to not get clean, and it is a serious fire hazard if your dryer isn’t venting properly. When we install your washer and dryer set, we’ll make sure everything is working as it should before we leave. There are a lot of moving parts on dishwashers, which can mean they often break down more frequently than other appliances. This is unfortunate because dishwashers are an incredible time-saver and almost a necessity for parents who want to sanitize baby items before using them. Common issues you may have with a dishwasher is a faulty drain pump or heater element. It Is Fixed Appliance Repair carries parts for all major dishwasher brands. If your dishwasher is leaving your dishes dirty or not heating the water, we can help. There is a wide variety of stove, cooktops, and ranges available. You may have a glass top, coil burner, gas, or induction stove. Whatever you have, we have the tools and experience to fix them all. Due to the risk of fire, it’s important to fix issues quickly. If you smell gas when you use your stove, or you have a burner that won’t turn off, it can be an emergency. Don’t worry. Instead, call It Is Fixed Appliance Repair. In most cases, we will be able to come out right away to fix the issue. It Is Fixed Appliance Repair firmly believes in the healing and restorative power of a warm, home-cooked meal. It can be hard to make your favorite dinner if your oven is smoking or won’t heat up. If nothing else, it makes creating delicious cookies more difficult (and really, life deserves cookies). A toaster simply cannot replace a real oven. You shouldn’t have to settle for half-baked dinners. Call It Is Fixed Appliance Repair, and we’ll get you set for dinner. Microwaves are very useful tools. They can do more than heat meals; you can even bake a single-serve Chocolate Mug Cake in your microwave! Many people believe that microwaves are closed units and cannot be repaired. This is simply not true. If you have a high-end microwave, not only is it possible that it can be fixed, you may also save a lot of money by choosing to repair. What do you do when your washing machine doesn’t drain? A standard top-loading washing machine holds up to 45 gallons of water. Even high-efficiency models can hold as much as 25 gallons. The following troubleshooting guide can help you locate and resolve the issue without flooding your home. Dishwashers aren’t just time-savers, they help sterilize your dishes as they wash. What do you do if you load up your dishwasher only to discover it won’t start? This useful troubleshooting guide can help. When your refrigerator or freezer is not staying cold, it can ruin your day as well as your dinner. This troubleshooting guide can help you locate and resolve the problem quickly. I am more than happy with the service that this company provides. I had another company coming over and laying about issues that we had with microwave-speed oven. Jacob from IT IS FIXED come over and did a GREAT JOB yesterday. He fixed all very fast and told us the truth about the issue with our microwave. Also, the cost was 4 times less than the other company said that will be. I highly recommend “It Is Fixed Appliance Repair”. Great job guys. Thanks so much. Can I say wow??!!! I own a restaurant in Atlanta GA, I needed an emergency service, they were the only one who was reasonably priced and came out the same day and took care of the problem professionally !! Thank you guys I greatly appreciate it!! And will recommend them to anyone!! Believe the hype! This is a great company. I contacted them desperate because the Samsung repair center never got back to me. They were here within 3 hours on a Friday during holiday seasons and fixed my problem in under 20 minutes. From speaking with Umid and Jacob handling the repair, overall great experience. They’ve earned a customer for life.